This graph sums up one reason why McCain should not be elected President in November. => For a more extended analysis of the larger political and economic meaning of these tax plans, consult Paul Krugman, whose discussion is on-target and illuminating, as usual. McCain's tax plan helps the top quintile of the income distribution, and really helps the top one percent and tenth of a percent. Obama's plan is better for the the other 80% of the population. 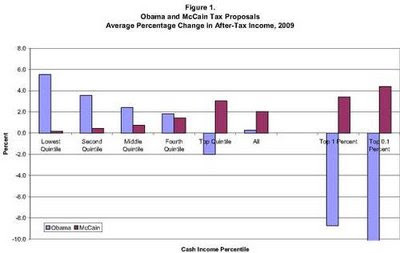 If enacted, the Obama and McCain tax plans would have radically different effects on the distribution of tax burdens in the United States. The Obama tax plan would make the tax system significantly more progressive by providing large tax breaks to those at the bottom of the income scale and raising taxes significantly on upper-income earners. The McCain tax plan would make the tax system more regressive, even compared with a system in which the 2001–06 tax cuts are made permanent. Not to mention that McCain's proposal is $1.3 trillion further out of balance over eight years, not even counting the cost of a semi-permanent presence in Iraq, which McCain supports but hasn't budgeted for. Just remember this when you hear about "inexperience" and voting "present" and "bitter" and Rev. Wright and William Ayers and Rezko and Michelle Obama and "Muslim" and "Hamas" and all the other crap the right wing is going to throw at Barack Obama: for them, this election is about whether the federal government keeps waging class warfare on behalf of the prosperous, the wealthy, and the filthy rich against the bottom four-fifths of the country. They're for it. Obama is against it.